Review Context: In case you haven’t noticed, I’m a huge fan of the Super Mario Bros. franchise and was waiting for a game where we can create Super Mario Bros. levels that weren’t a ROM hack. Back when I was young, I was given a sketchbook for my birthday. With that, I drew a lot of sketches back when I had a lot of free time on my hands. One of those sketches would be my own Super Mario level. I’m sure I wasn’t the only one who did this. For a long time fans wanted a game where they can create their own levels. While other games have tried, it didn’t have the same feel (unless you played those PC hacks). 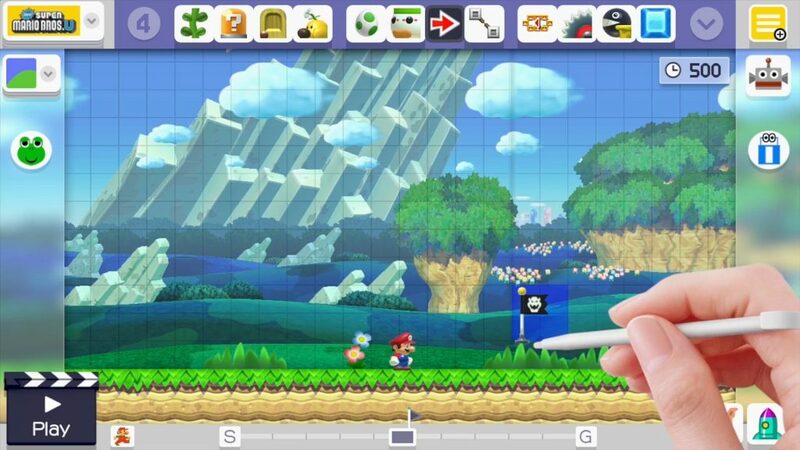 To celebrate 30 years of the franchise, Nintendo decided to give the fans what they wanted and have you create Super Mario levels… officially. Will this game help future gamemakers on how to create fun levels, or will you just play the 25th anniversary Super Mario All Stars for Wii? 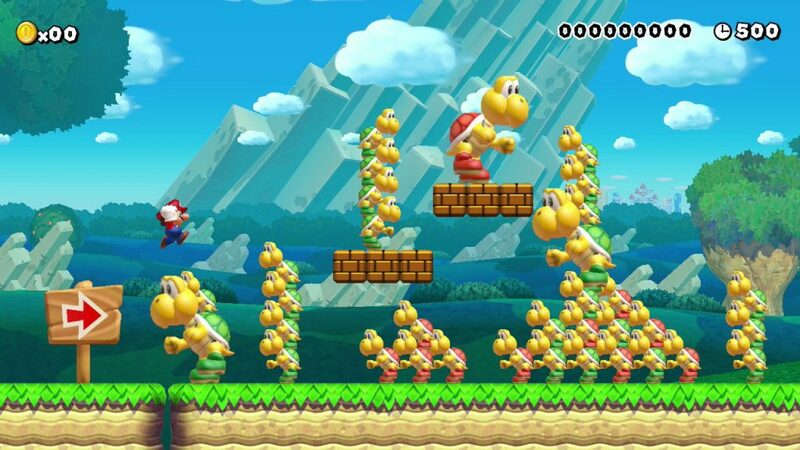 When the game was announced at E3 2014, we were only given looks from Super Mario Bros. As time went on, more about the game was revealed such as being able to create levels from not just Super Mario Bros. With that you would expected the visuals to look the same as it did then. 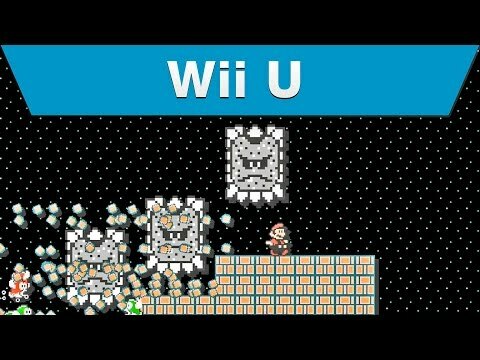 Yes and no; Yes, the visuals are the same as it looked then, but there are extra elements added in Super Mario Maker you might not have noticed. The sprites having shadows is one of the many small things I noticed in this game. The visuals from Super Mario Bros, Super Mario Bros. 3, Super Mario World, and New Super Mario Bros U look great, but what makes it more interesting is creating levels and adding elements that weren’t present in other Super Mario Bros. games. Backgrounds are given extra elements. Creating a ghosthouse or an airship level in Super Mario Bros looks good and makes you wonder how the levels would’ve been if they had those levels back then. The game does a great job of reminding us how far we’ve come in gaming when going from 8-bit to 16-bit to high definition. There are even bonus bits where you can change to visuals to a CRT mode and the wavy screen effect on old TVs when the connection is loose. If there is one complaint for me, it’s that in Super Mario Bros 3, the P meter is on the top left of the screen instead of the bottom throwing me off a bit. While playing levels gives you the option to use multiple control schemes, creating levels on the Wii U Gamepad is a must, though you can use the Pro Controller and it will be harder. For playing the levels, you have the option to change the button layout. Since this has four Super Mario games, the controls vary per game. 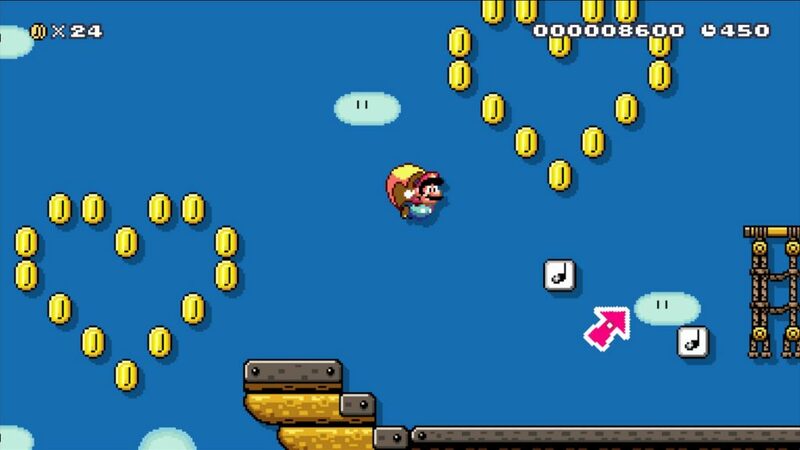 For example, in New Super Mario Bros U, you can wall jump and spin jump, in Super Mario Bros. 3 you fly by tapping a button, while Super Mario World has you moving the D-pad back to glide. The controls are still tight and having only yourself to blame if you die. However, I have noticed the controls have changed somewhat. I noticed in Super Mario Bros. when you get the star man, Mario runs much faster than he did on the NES. This game was made for the Gamepad, as you use the touchscreen to add and remove elements you want in the game. Shaking an element can have different effects, like shaking a Green Koopa Trooper will turn him into a Red Koopa Trooper. I found myself creating levels while lying in bed since you are focused on the Gamepad when creating a level. Overall, the controls for creating levels on the Gamepad are simple and deep. For me, this has set the standard of how easy and fun creating levels should be thanks to the Gamepad. As stated earlier, this is a game where you create or play levels, however, not all the assets are available from the start. You have to create a level for at least five minutes a day to unlock a new feature. I guess Nintendo didn’t want us to be overwhelmed with features. You can cheat the system by changing the internal clock, but with the day one patch, it made unlocking items much easier. Once you unlock all the features, how you create the level is up to you. Wanna have an auto-scrolling level while defeating giant Bowser with wings? You can. What surprises me about the game is how easy and deep the process is, thanks to the Gamepad. I spent from ten minutes to almost an hour creating a level. With that, they also added new features I didn’t expect. Having the ability to use a Spike or Buzzy Beetle’s shell as a helmet to shield you from attacks is fresh. In short, you can create a short puzzle level, thanks to creating sublevels with pipes and doors, or a long hard level with lots of enemies on screen, small or large. There are a few moments that throw me off when playing; In Super Mario Bros. you can go back and the transformation is different. For example, in Super Mario Bros. when you are fire Mario, if you get hit you go back to small Mario, but in this game if you get hit, you go back to Super Mario then small Mario. Super Mario Bros. 3 and New Super Mario Bros U were the games to use that hit detection. 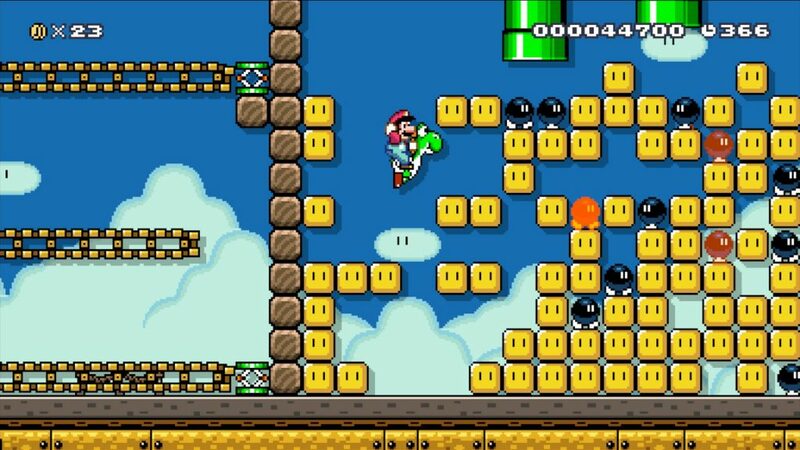 To see it being used in Super Mario Bros. and Super Mario World is confusing to me. To get a feel for the levels you will be playing, the 10 Mario challenge has you playing levels pre-made in the game with ten lives. While the game does not have two player support, the game does have online but for other reasons. The online is made to share your levels and have others comment and star your course. As stated earlier, you can create a crazy course, but to prevent troll levels from getting through you must pass the course before it can be uploaded. Once that’s done, you are given a code to give people to play the course. While the game does have a notification for when someone plays your course, it doesn’t alert you when someone you followed has uploaded a course. Hopefully that can be fixed. 100 Mario challenge has you playing courses from the online community with one hundred lives (after one week of release over a million courses have been uploaded) on three levels of difficulty. Easy has you playing eight courses, while Normal and Expert has you playing sixteen levels. When you beat the challenge you are awarded a special character you can use with the mystery mushroom. On the subject, the game uses amiibos as a character you can use. however, they can only be used in Super Mario Bros. It is nice that you don’t have to own an amiibo to unlock this. Can you collect over one hundred characters? In Course World, you can check up on who has the best levels and can play the levels or download for offline play (or edit). When you play an online course and die it shows where other people have perished. A friend and I played a level based on Super Meat Boy and we spent almost two hours trying to beat that level. Upon writing this review, Nintendo has released an update to the game (1.20). With this, you are able to create checkpoints, (as long you can pass the checkpoint without dying to prevent cheap deaths), merge power ups, and an events page. The events page has levels made by people within Nintendo or a famous game designer. As an added bonus, if you beat some of the levels you earn a special character based on the level. You can also follow the Nintendo made levels to see when a new level is uploaded. These added new features make the game even more enjoyable. 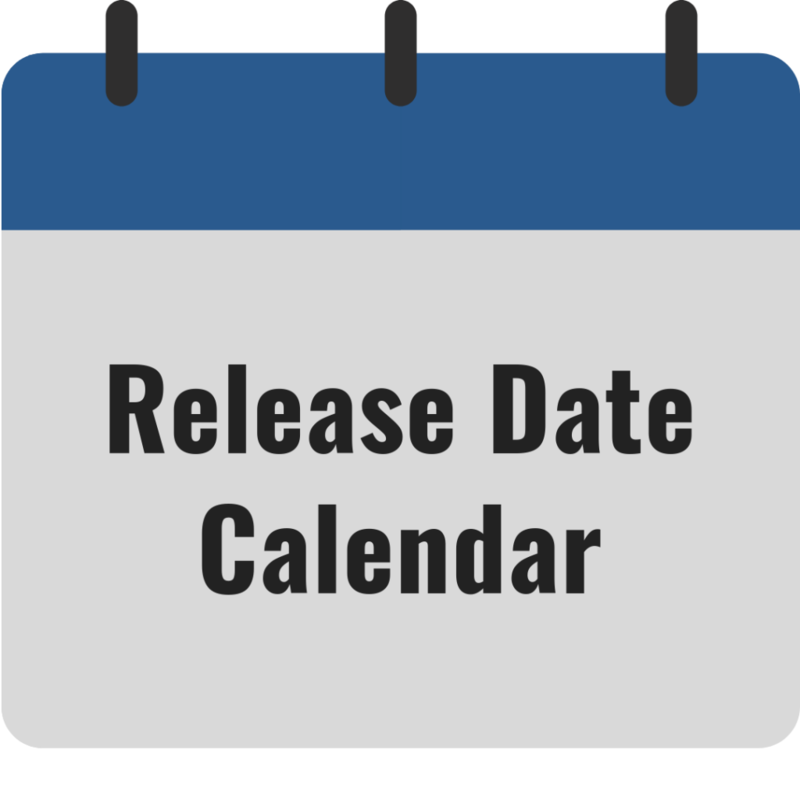 In short let’s hope there are other maker games in the works. All of the music and sound effects fromf the four different Super Mario games are present, but there are some new tunes as well. I liked how they performed a “what if” for some levels. Since there were no ghosthouse or airship levels in Super Mario Bros, the theme they came up with works well with the 8-bit tune. As you place items on the level you’ll hear a voice calling out the object or enemy. My favorite is when you add elements nonstop, because the sounds moves to the beat of the music. When you play the level with a special character, they have their trademark sound effect (except for the Pokémon), as well as their victory theme. There are lots of bonus bits you can add with the sound effects to make the game crazier than you can ever imagine.